I called on Annie last week, she'd sent me the email and pics below, and I had other reasons to go north to Whangarei where she is at the moment. She's taken over my friend Marcus Raimons shed, and is busy building a replacement for the deep keeled junk rigged conversion of a Raven 26 production yacht thats been her home for some years now. She has enjoyed that little ship, there is much to like about it but as she says, for her lifestyle there is a lot of prime water in New Zealand that is shallow. That plus being able to run her up the beach for a bottom scrub or maintenance is a saving, and Annie is very good at "saving", she can live comfortably on less money than anyone I know. Her new build is really interesting, Designed by David Tyler, ( I know the first name is right but might have to correct the surname, apologies David if I"ve not got it right.) with a lot of input from Annie its her dreamboat, the one that she wants to spend the rest of her life sailing and living on. It's to be 26 ft long, she says thats the "magic number". Has a big slab of steel under the centerline, that will add immensely to the strength of the boat as well as being ballast, has two housed bilgeboards which double as legs when the boats grounded, junk rig of course, an outboard mounted in between the twin rudders, those with their skegs being strong enough to act as supports when the boats aground, and an interior scaled to suit Annies small frame. For scale note the Barbie doll and her comments. By the way, I impressed upon her that her fans would be expecting a book out of this. So without further ado, here's her email and the pics. Way to go Annie! and I undoubtedly owe you a reply to a letter you wrote me ages ago. The trouble is, that it's probably going to be quite some time until I get round to sending you that reply. I do, however, have an excellent excuse: I've started building myself a boat! I have been assured by one who presumably knows me well, that I could reasonably be described as having lost my mind, but that's what happens when you turn 60! I love Fantail, of course, but North Island is an area with lots of shallow water, and I want a boat that can take advantage of this. In addition, Fantail is now 30 years old and I don't really want to be maintaining a boat of this era in another 15 years. 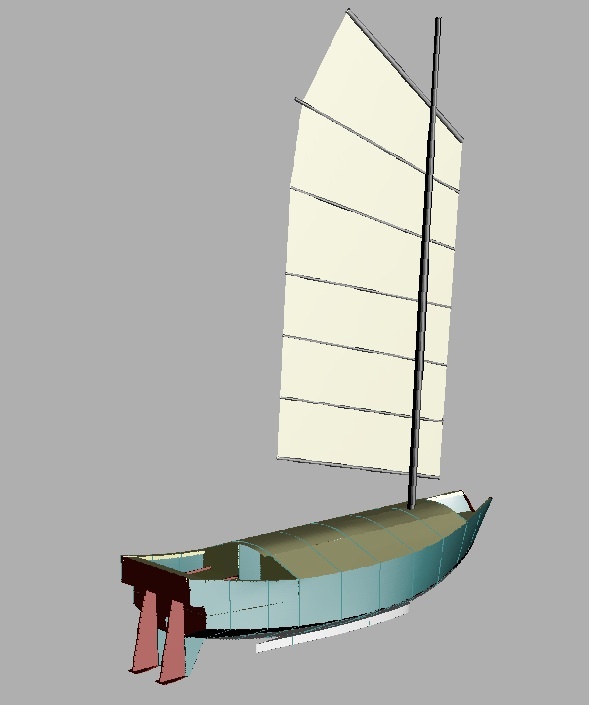 So I've decided to build my perfect boat, which, hopefully, will see me out. 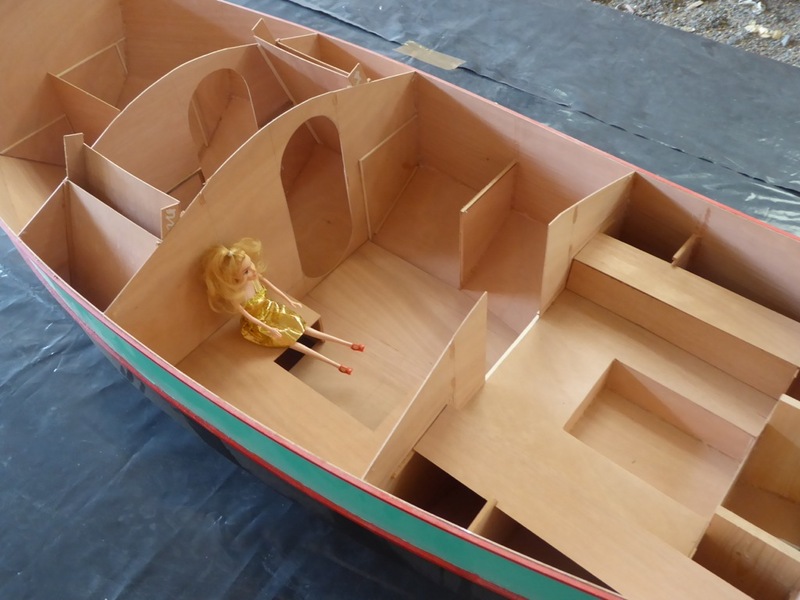 Below is an impression of the finished boat (although mine will be painted in different colours) and a photograph of the model that my friend, David, who designed the boat, and I made. The blonde lady represents me: she is the right height in her high heels and including the topknot, but the rest of the proportions are a bit iffy!) David is helping me in the early stages, before sailing off over the horizon leaving me to carry on alone. But I have heaps of supportive friends, here, so feel fairly confident that when I need a second pair of hands, there will be someone I can call on. So please forgive my not being in touch, and forgive the fact that I probably won't be much of a correspondent for another year or so. 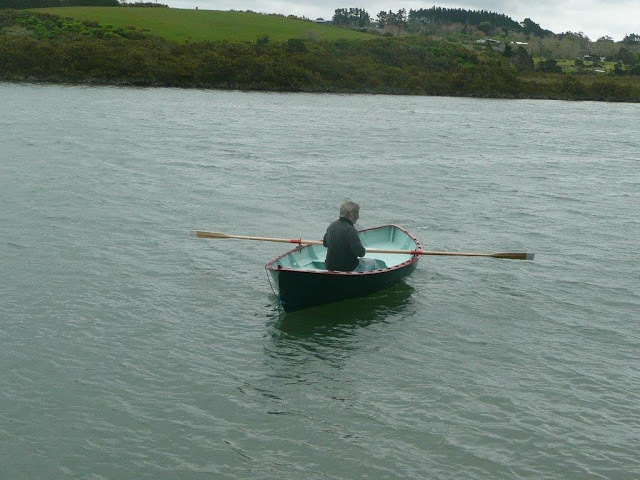 But once my little boat is launched, I promise I'll try and catch up again. I’ve been running this blog now since January 8th 2011. For a while it was an on and off thing, not regular, or much of a priority, but of late I try to find something of interest about Thursday each week so you’ll all have something to read. Its worked well, not a lot of “followers” but there are plenty who just come and read now and again, the stats column that we bloggers can access shows where the readers come from and which posts pick up the most page views, and that enables me to see what subject matter is of interest. A month ago, I was thinking that I might make it to 200,000 page views total by the end of the year, and thinking that was good going, and it is for a lot of bloggers so I was pretty happy with that. But with a comment or two about the new “Saturday Night Special”, “SEI” and “Long Steps” designs there has been a considerable upturn in readership, and we rocketed past the 200 K page views total and are now close to 205 K and booming along ( so to speak). Its gratifying that there is so much interest, and I thought that I should thank you readers for your interest and your patience when a post is late or missed. It’s the readership that makes this worthwhile, it makes me feel as though I’ve friends everywhere, thank you, all of you. An example of a relationship that has grown without having met him, is this photo from Steve Earley who sails his Pathfinder design "Spartina' in the Chesapeake Bay and North Carolina area, he's a particularly good writer and his stories of cruising in that area are a wonderful tonic when, he being in the northern hemisphere summer I read his tales in the depths of my winter. He's done a nice job of Spartina, and here he is out enjoying her. Nice one, thanks Steve, I do hope we'll meet up sometime. Steve Earley photo. Thanks Steve, now isn't that a great picture! 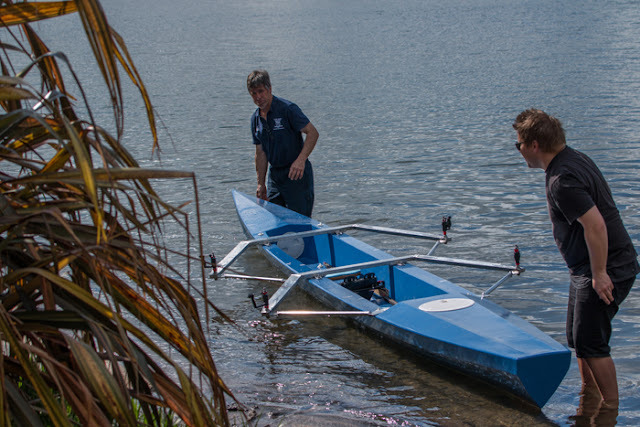 Alistair Riddle is a rower, not in the usual sense that we small boat cruisers know, but in the competitive sit on a toothpick with monster oars out on outriggers and blast down a laned course kind of rowing. He’s mostly a coach these days, a keen member of his club and very knowlegeable about the sport. Now here in NZ rowing is quite a big deal, many schools have active rowing programs, there are clubs on most stretches of usable water with age group and graded racing going on for most of the year. Alistair lives by Lake Rotorua in the center of New Zealands north Island, it’s a fair sized puddle, and at times can be seriously rough water. Rough enough to preclude taking the usual rowing shells out, and he was wanting to promote a boat that would be a practical two person all weather trainer, one that was not dependent upon dead calm water, and which would be affordable. 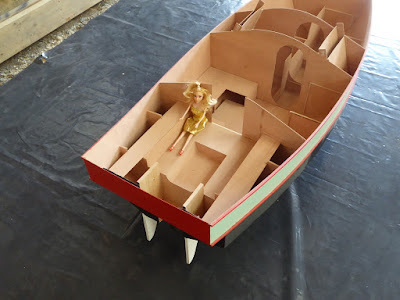 Rather than set up a boatbuiding company with moulds for fiberglass it was thought that kitset builds in plywood would work, group or club builds in the way that parents in clubs or schools used to build their kids sailing trainers would work. As the boats were to be trainers rather than racers, and if racers would have their own class, so expensive high tech weight saving was not so important. I drew the plans, much attention to the geometry of the seats, outriggers, oar gates, footrests and such ( much sweating on my part, got it very close to right, yay! Much relief, this is critical). Much attention to the distribution of the air tank bouyancy, and how the cockpit trench fitted. It is a requirement that the boat be able to be boarded from deep water if capsized so the big bouyant side tanks are a part of that. In designing that part of the structure I had to endure the mirth of several women and their friends when I asked if I could measure the width of their behinds, well any excuse, but I did really need to know how wide the cockpit sides needed to be apart so a “mature” woman would fit. Alistair had not built a boat before, so there were regular phone calls for a while, learning about fiberglass and epoxy, taped seam plywood construction, how kits are cut ( thanks David Milsom of Red Shed enterprises in Cambridge, great service) and all the intricacies of a whole new trade. We’ve a little tuning to do, not much, she’s performing as expected and within a few days she’ll be out at some senior club members lakeside homes for a tryout among them. Kits will be available, give it a little while for the assembly manual to be written up, and there is some thought being given to a single scull version. The prototype is complete, she’s been out for her maiden voyage, and Alistairs emailed report is below. __________“Afternoon John, well we got it wet - first impressions are that it’s quite lively and runs along very nicely with a good feeling of speed. And it looks good I think, and was fun to row. I didn't have time to put the keel on and noticed it - it ran in a curve one way and then the other and not too much dead straight. 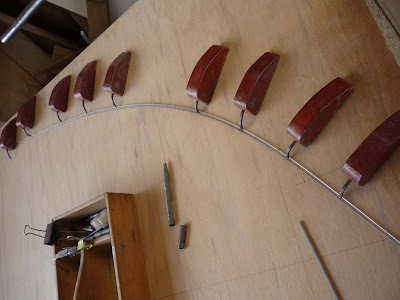 You have a keel in the plan just 1.5m long I think or less running from zero to about 50mm height, 6mm ply - does that seem enough to you ? 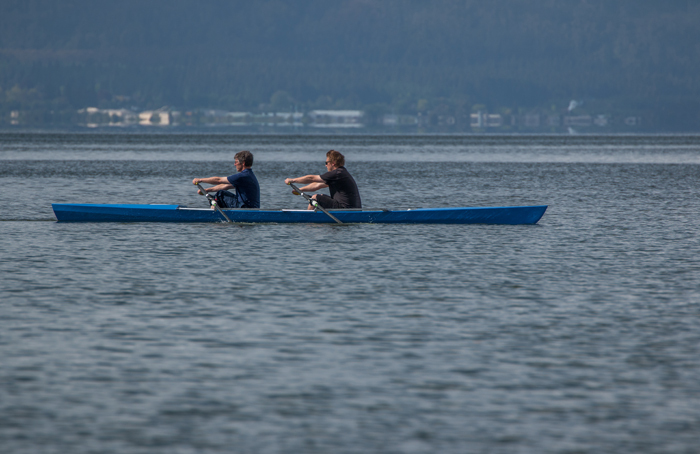 interesting..
Second thing, I didn't realize it at the time but my son is 105kg and I had him in bow seat instead of stern so you'll see in the photos with us at the finish of the stroke that its bow down more than I'd like. 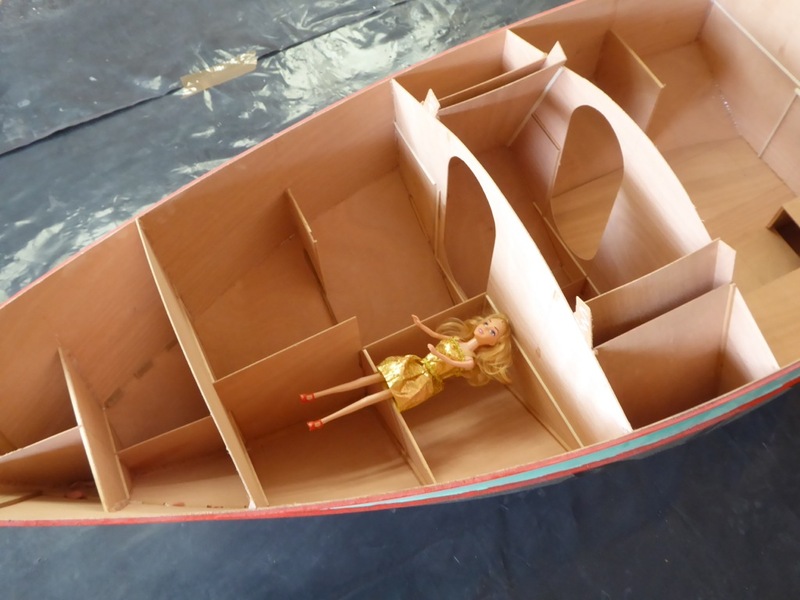 The next boat is slightly wider so it might be a little more forgiving of extra weight. 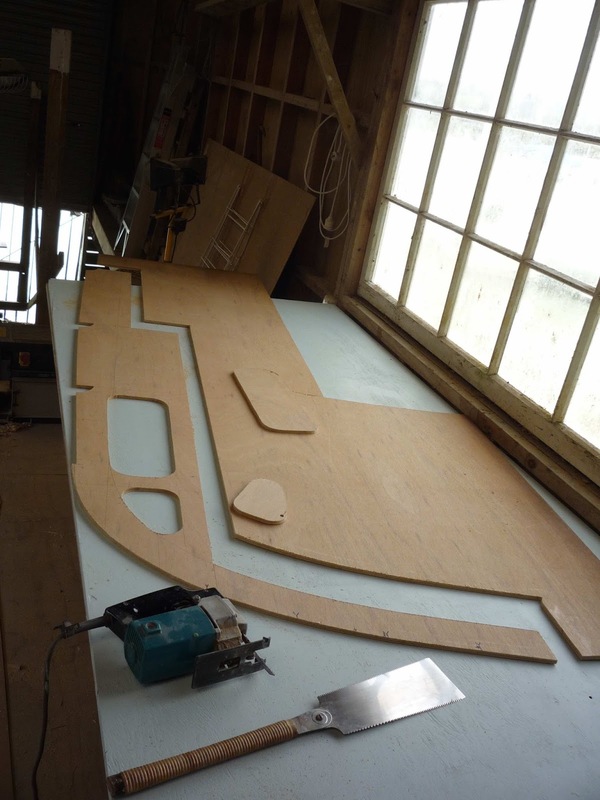 David Milson will cut the second set of plywood in the next few days - I've been redoing the plans and cut sheets over the last 4 months. Geometry is good. When building, the seat ended up 160 above heels and we put riggers 160 above that. When we put it in the water it floated where expected and we changed the gate height easily to suit each of us with the 'C' washers that clip above and below the gate. Its tippy, but not as sensitive as a racing boat, and we did a half hearted lean to one side and it seemed harder to push over the further we got. We'll tip and recover when its warmer. When we sit it in the water with no-one touching it it sits perfectly level. ( I’m more used to that issue of lifting the boat up onto a car, and there is a way to do it that wont bust peoples boilers - JW). 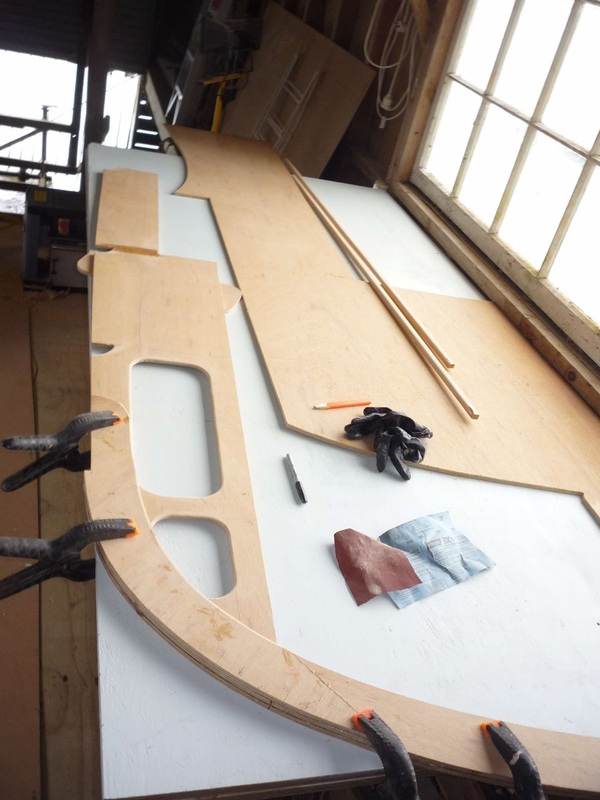 The new boat, the design and the first piece of ply cut. Long Steps, the build has begun. I’ve four frames drawn, the stem, and the spine for the forward section, the mast box and some of the detail around the “cabin”. The drawing is progressing in my “spare time” as I’ve other jobs to get completed before I’m really free to get on with my own project, but I need a break now and again and wanted to get started on “Long Steps” so the overall timeline does not become impossible. To give an outline of “the project”. I have thoughts that as the numbers on my birthday cake are getting alarmingly large, its evident that if I am to have that life defining adventure then I’d best get on with it. 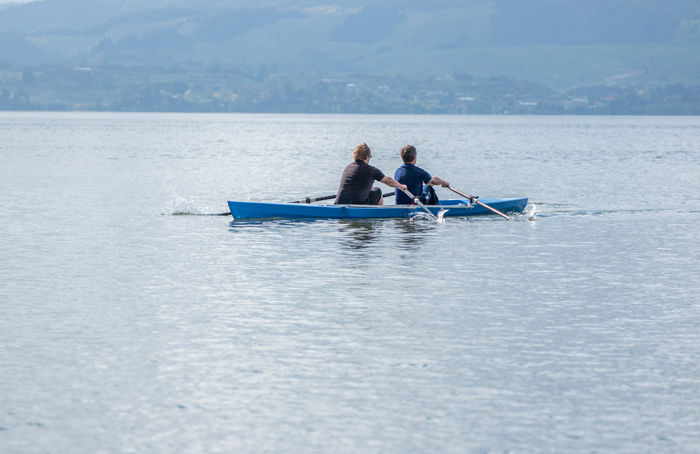 A second motivator was an article in the newspaper last year that described the adventures of a young woman who’d kayaked alone right around New Zealand. It took her a year to cover the distance of around 2100 sea miles, with a few of breaks along the way. What an adventure, she’ll remember that forever. I’m not quite as ambitious as that, but to get around the North Island is workable. That’s about 1300 nautical miles, only a little less than the distance around the British Isles, or the distance from San Diego to Seattle. About, don’t quibble over the odd mile or three. 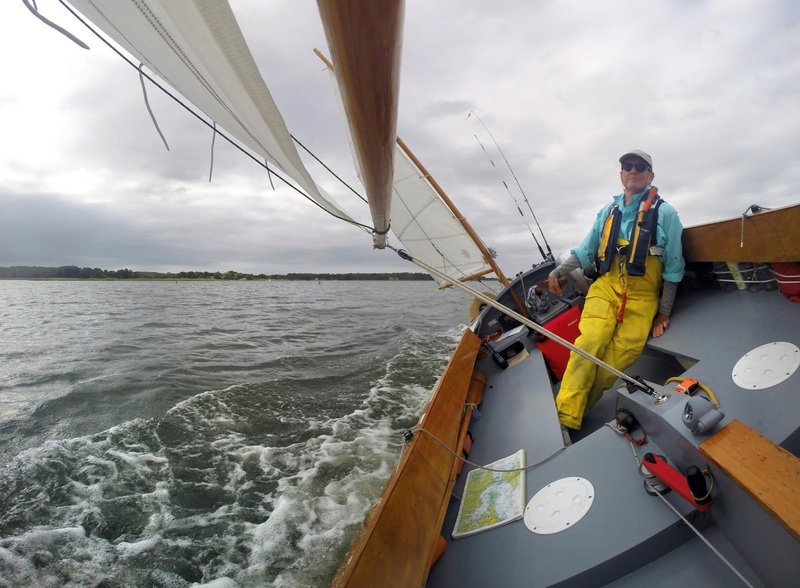 In an open sail and oar boat. Mostly open anyway. The circumnavigation of Te Ika a Maui ( North Island of New Zealand) has some challenges, I’m planning to try local voyages first, and have put a lot of thought into the design, so, below is a pic of the working drawing. She’s 5.520 metres long, 1.660 wide, I’d expect a dry weight of around 220 kg. That’s 18ft 6in x 5 ft 5in x 460 lbs. Sail area 13.5 sq m / 145 sq ft.
One of the “interesting” things about the planned voyage is that there are at least two long stretches with either bar harbours with prevailing onshore winds or no shelter at all, even in favourable conditions these two stretches of coastline could take up to three days to cover so nights at sea have to be provided for. 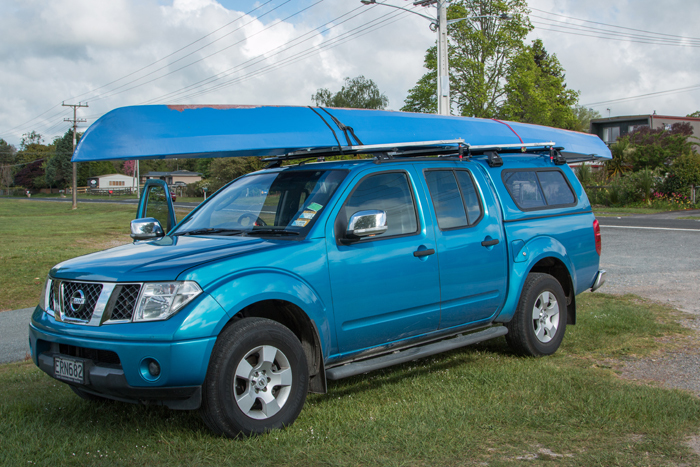 Shallow draft is a must, there are some shallow river harbours in some places, but much of the course will be in very open waters, so this is to be essentially a blue water capable boat. Now I’ve mentioned this to people who’ve banged on about Shackleton and Bligh, but I’m not that tough, so safety, self reliance in emergencies and a modicum of creature comforts are all part of the design brief. What I’ve done is to take the midsection of the very successful SCAMP design, with its high up bouyancy, sheltered “veranda”, self draining cockpit and water ballast. The same offset “board” and lying down space is there, along with the massive dry storage that the little boat offers. 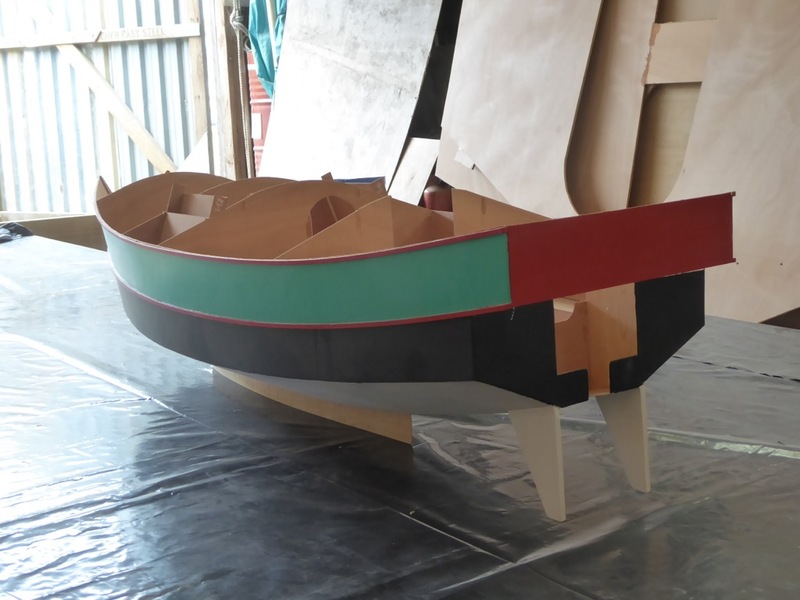 This is fitted into a hull shape similar to that of the “Walkabout” design, that boat is very fast under sail, rows well, is easy to right if capsized, and is a very good load carrier. The ducks and batten marking the curve of the stem. I started the build today, drew out full sized and cut the stem and spine, cut and glued the doublers around the stem, cut and finished a stack of cleat material and sanded the whole lot so they’re going into the boat almost completely “finished”. The first cut, thats a Makita 10.6 volt cordless circular saw, nice tool, very accurate, light and easy to use. Its great on plywood up to about 12mm. The spine, stem, and mast box support will have B#1 B#2 and B#3 slotted over it egg crate style. 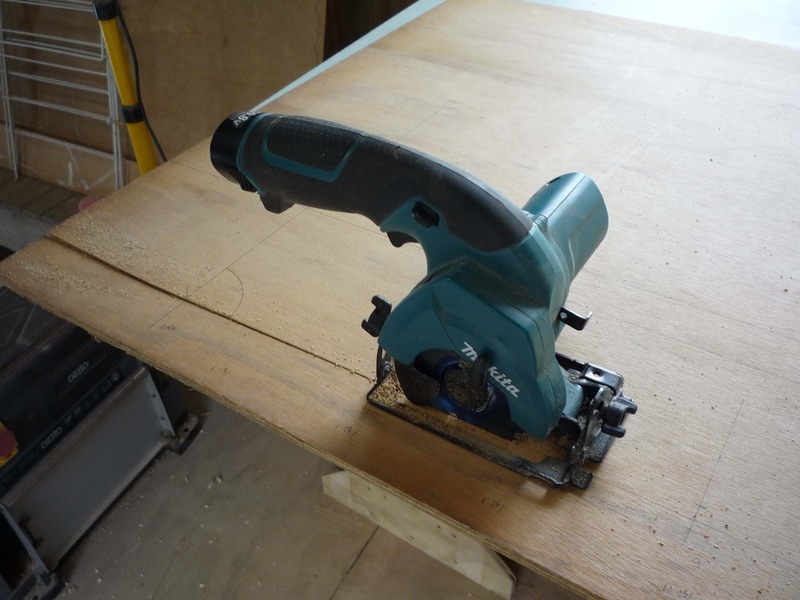 The jigsaw is a Makita 4200 BV, I've had it for over 30 years and its done a huge amount of work. Good machine. As is the Japanese saw, wouldn't be without either of them. Doublers cut out, the edges radiused with a router and all glued up. Progress already! 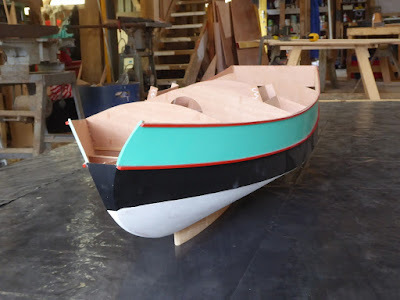 Tomorrow will see B#1 and B#2 cut out, I expect to be putting the whole lot together on the building frame in January, I have to extend the floor in the boatshed, plus have an adventure in the Straights of Magellan which will soak up a few weeks around the end of the year. Plus I still have to get some work done. But I’ve started. The boatshed / workshop is not empty any more, the symptoms of empty workshop syndrome are under control again. Today I had a small job to do in Whangarei, I knew it was only about a 10 minute job, had tried to talk the owner through the procedure but he just could not get it right. He was frustrated enough to be happy to pay me to drive for two hours each way to do the job and get his machine back into service, so off I went. Whats special about Whangarei? Cruising yachts, hundreds of them, up in boatyards being worked on, lived on, modified and repaired. Same with the moorings, lots of boats with character, flags from all over the world and I kid you not, I saw flags from England, France, Netherlands and Germany, South Africa, Uruguay, USA and Canada, plus a few I did not recognise. But the really interesting thing about Whangarei is that my friends Annie Hill and Marcus Raimon live there. 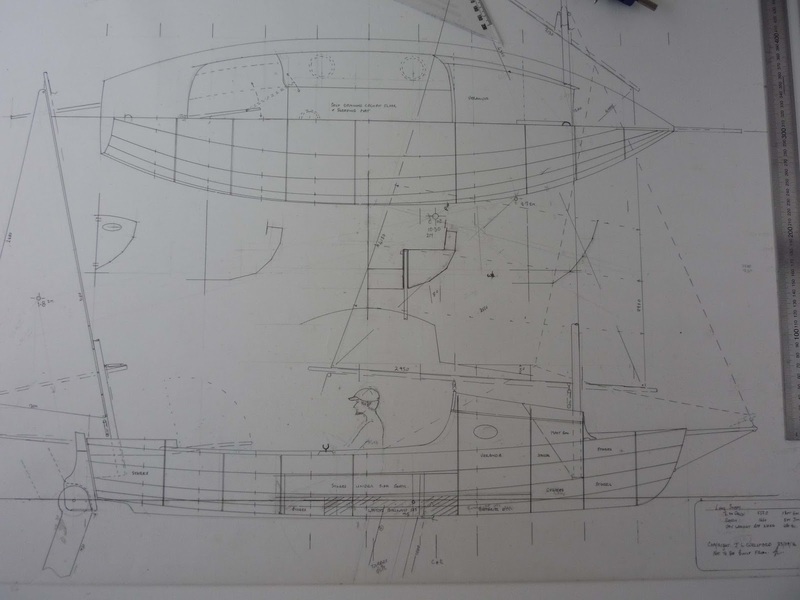 Marcus has just bought a Flicka 20 and makes his home thereon, Annie has taken over Marcus’s shed in Norsrands boatyard and has started building a replacement for Fantail, her 26 ft liveaboard. I’ll get back to you on that. Next post, its interesting stuff. But home as must, and I was sitting in my bunk at about 8 this evening, there was still a little light left from a spectacular sunset, it was slack water low tide and the wind that had been a pest all day had run out of puff, and---- well, it only took about two minutes to slide SEI off the dock and into the water, and I was on my way. She left a glossy flat wake with twin whorls each side from the oars as I stroked along, she moves very sweetly and leave hardly any waves at cruising speed, and the work is just enough to bring on the “runners high” the gentle endorphin rush that moderate exercise can engender after 15 minutes or so. That makes an hour go past very quickly, the mind aware and functioning but in a state of mild bliss. While in Whangarei I’d had an hour or so before Marcus would be home from work on lunch break, so I’d driven around the waterfront suburbs with an eye out playing a favourite game. It goes so, “If I could afford to buy it, would I live in it?” There were very few that ticked the boxes, and it was as I hauled SEI out of the water with my little dog sitting there telling me that he’d been a good guy and waited patiently for me to come back, that I realised just how lucky I am to live here on the water. It was a good day. Hope yours was too. Friend Blair Cliff took this, or Emma, same camera, either way this pic was taken a week or so ago so you'll have to imagine that its low tide and dark rather than high tide and daytime. Same me, same boat though.